SPARTANBURG, SC: Restaurant chain Denny's has launched a new campaign "America's Diner is Always Open," to position the brand around a new theme of "openness." SPARTANBURG, SC: Restaurant chain Denny's has launched a new campaign “America's Diner is Always Open,” to position the brand around a new theme of "openness." 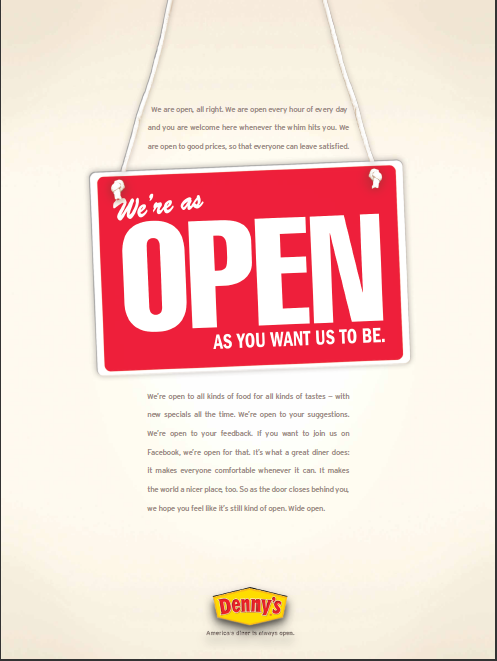 The openness theme is being conveyed in a redesigned website and Denny's Facebook and Twitter accounts. On Facebook, for instance, Denny's has created a page called Overheard at Denny's, where people share funny things they've overheard at the next table. Gotham, which created TV ads for the campaign, also recently took over Denny's social media strategy. The agency was first hired in August, following a competitive review. ICR is handling corporate PR for the launch, while Erwin-Penland is handling local market/consumer PR. To engage employees, Denny's developed an “Open Manifesto,” which encourages staff to be open to suggestions and feedback from guests. “Employees are absolutely fundamental to how our guests are treated and the brand is perceived, so we shared our positioning and advertising with them ahead of the public through rallies, training, and other communication,” Allen said.